What is uva online judge after all ??? According to wikipedia , UVa Online Judge is an online automated judge for programming problems . The system can compile and execute codes and test them with pre-constructed data. Submitted code may be run with restrictions, including time limit, memory limit, security restriction and so on. The output of the code will be captured by the system, and compared with the standard output. It will then inform you whether your solutions are correct (AC) , or faulty and in the latter case it will also tell you what the problem was viz.. The registration is open to all users (and free of cost too :D). A user may submit a solution in C, C++, Java or Pascal. You just have to get yourself registered at the site . Read and understand the problem statement . Devise an algorithm (may vary from a very simple one to an extremely tougher one) to solve the problem . Implement the algorithm in C, C++, Pascal or Java . Finally, if you are convinced of its correctness, upload your code to have it judged. The judging is automated (they use benchmark input and output files), so you can typically expect a response within a few seconds. 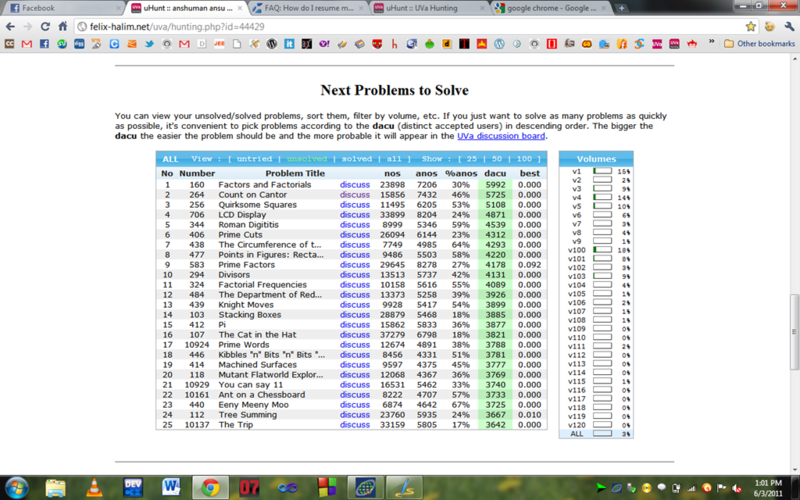 After all the theory above (we have had enough of it :P) , lets try and solve a problem at the uva site. Scroll down and you will get a hint to the problem . Log in to the uva website . Go to Quick submit on the left . Enter question number on uva site (10007 here) , choose a language (click on C for above sample code) , copy-paste your code here (you may browse it as well :) ) and submit your code Congratulations !!!! you have now submitted a solution at the uva site (if you get AC- accepted) . You can check the status of your submission by selecting the “My Submissions” link on the left side of the page. The “Verdict” heading will tell you if it was solved or if there was a problem (e.g. wrong answer, ran too long, crashed, too much memory was used, compile error, etc). Now go ahead and solve some more problems !!! As there are large number of problems to be solved, you have to select problems. The best way according to me is Felix Halim’s website. Just punch in your username and see the miracle. Bookmark the page, at least that’s what I did :D .
Another word of advice, the solutions for UVA are available abundantly on the net. Please do not copy, as this is not a competition! First try to solve a problem by your self. If you keep on getting WA’s, Try UVA Toolkit to check for critical input. If you still get WA’s, try reading on UVA forum and you might get critical test cases there! Still a WA then read a solution, but definitely write your own code! AC’s are heavenly, work for them! Have fun…Enjoy coding!!! 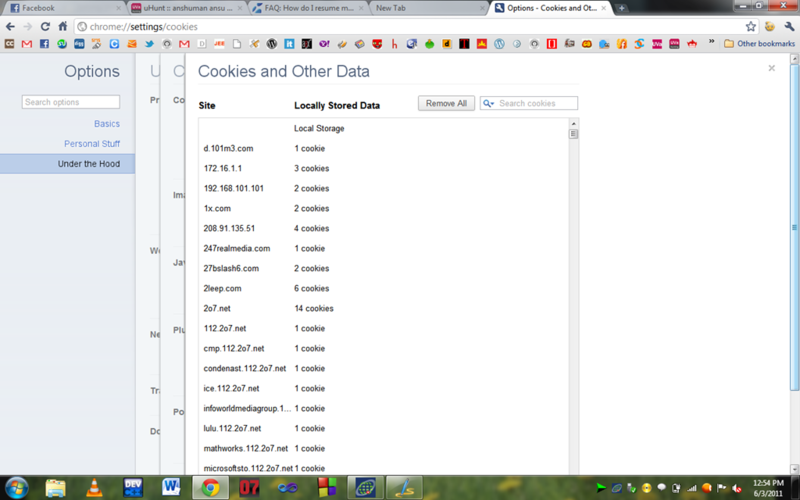 Click on “content settings”, and in “cookies” sections click on “all cookies and site data”. 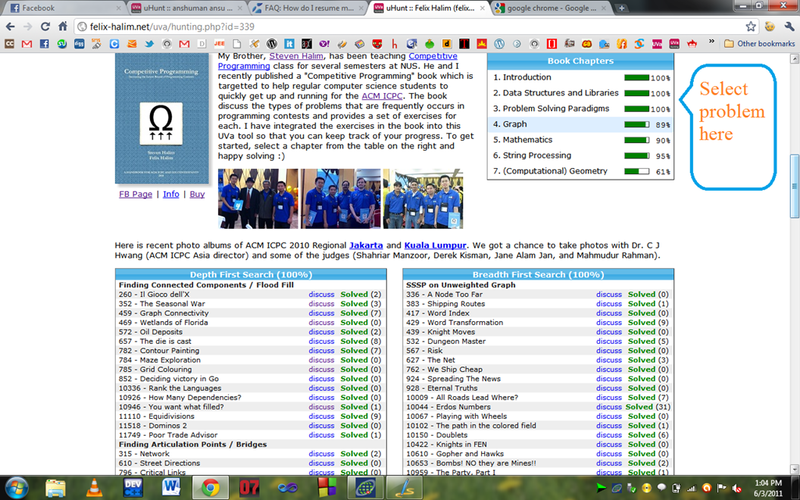 now search for onlinejudge.org cookie and delete it..Tada problem solved! ( P.S. the screenshots are from this page ). ty so much sir ... hope people start coding now !!! Did all this specially for juniors ..
My pleasure :) Let me know if you people want me to discuss any other topic !!! 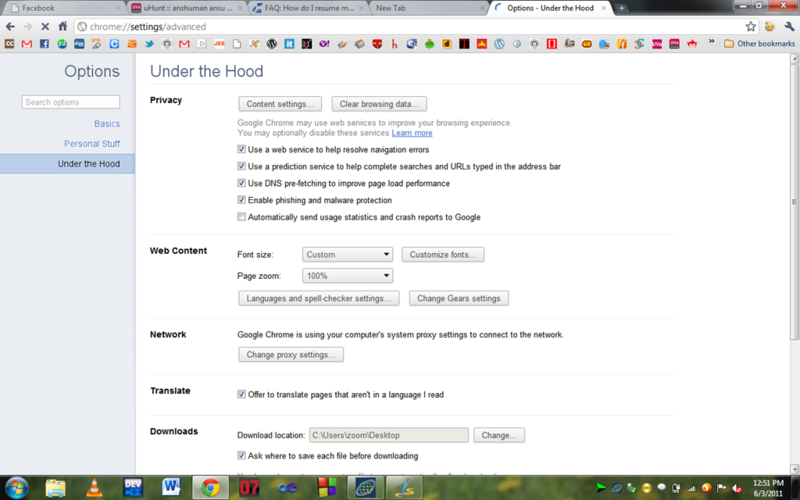 doesn't work in firefox either.. does the site work for you?